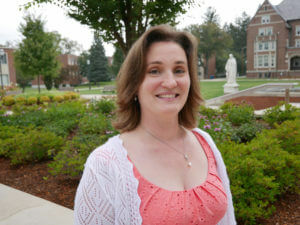 Juanita Duvall of Indian Orchard, Mass., won’t technically graduate from Elms College until May 2018, but she’s already in law school: The legal studies major is the first student to take advantage of the 3+3 program College of Our Lady of the Elms has executed with Western New England University School of Law. Under this program, Elms students apply for admission to the law school and begin their legal education during their senior year at Elms College — which can shorten the time for students to earn both their bachelor’s and J.D. degrees from seven years to six. When she started at Elms three years ago, she was only interested in advancing her career, but her classes inspired her to follow her passion for law. “At first, I was only interested in learning about the law, getting a paralegal certificate, and doing mediation. Once I got going, however, I was hooked!” Duvall said. “The possibility of going to law school seemed too remote even to consider at first, but with time and encouragement from my advisor, I began to truly believe that it might be possible. The program is not limited to criminal justice or legal studies majors — any undergraduate student, regardless of major, can earn credits toward law school under this program. For more information on the 3+3 program, visit http://bit.ly/2vGBifh.